Every now and then we are treated to a thoroughly entertaining film that also carries important messages. Avatar is such a film. The trains in Metroville were all painted bright yellow with green ends. They had comfortable orange seats and doors that hissed when they opened and closed. But they were mostly empty. Metrovillians preferred to ride in their roaring cars to go to work and to go shopping and to take their children to school. Wasting time on the Internet seems to be a part of modern life. I’m not talking about games or social networks or Googling one’s own name. I’m peeved about forced time-wasting, struggling with badly-designed web sites. There is no excuse for this (the bad design, not the bad mood). The reason I’m keen to include this review is that one of my stories is included. 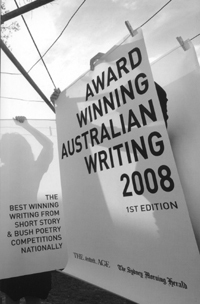 This is the first of what Melbourne Books plans to be an annual publication.